We’ve already shared some of our findings on the popularity of the World Cup’s opening game, and the first 5 days of play. Today we are turning away from TV viewership numbers, and taking a look at what teams GeoPoll respondents think are most likely to win the World Cup. 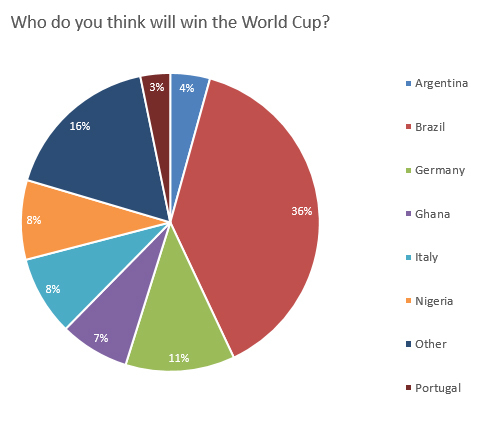 We have been sending a survey every day to GeoPoll users in 10 African nations asking “Who do you think will win the World Cup?”, and below you can see the initial results. We will update these results each week to show how respondents change their answers as more games are played and some teams leave the competition altogether. The below findings are compiled from 10 countries: Benin, Democratic Republic of Congo, Ghana, Kenya, Niger, Nigeria, Rwanda, South Africa, Tanzania, and Uganda. Overall, 36% of respondents think Brazil will win, followed by Germany at 11%. Only 7% and 8% thought Ghana and Nigeria will win, respectively. Looking to conduct your own custom surveys?